The debate is ON since the advent of the various baitcasting reels that have revolutionized the way anglers get to their fishing goals. Since spinning reel and baitcasting reels are different in terms of their construction as well as their operational features, sometimes it feels hard to decide on the kind of fishing reel you should buy. So, considering that you might need help in sorting things out, we have put forth a detailed account of the useful features of the best baitcaster reel and the best spinning reels here. In this article, we’ll discuss the perks and downsides of both types and how you may choose one of these depending upon your circumstances, fishing goals and level of expertise. What Are The Spinning Reels? Spinning reels are the simple form of fishing reels that come with a simple manually operated structure. Spinning reels are a good way to start using fishing reels because they are the simple, easy to understand and operate reels that most of the beginners use in order to make sure they can keep up with the fishing challenges. They are different because the spool is open and mounted at the top side that is visible and the line is cast easily sideways and straight as well. Baitcasting reels are different from the simple, spinning reels. These are more sophisticated, more compact and easy to set up fishing reels that are loved by professional anglers and experts who love the way the reel is controlled because it offers accuracy, line control and the variety in line thickness and weight that can be handled with it. The line casting mechanism is also different because it is cast accurately straight and needs a flip to get the line out of the reel. 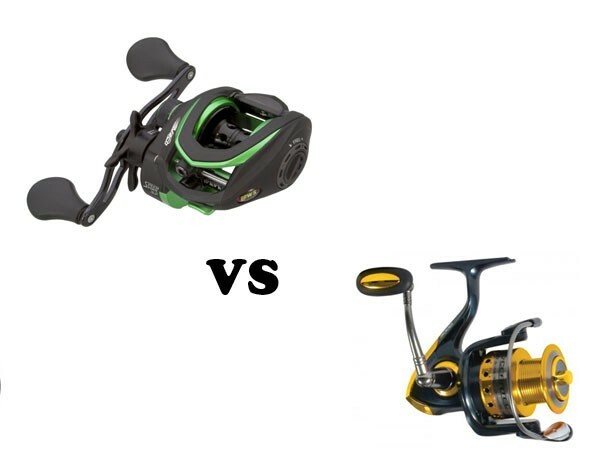 Which Features Make Baitcasting Reels Different From Spinning Reels? The reel design is different in both. Baitcasting reels are compact, low-profile and are sleek as well as lightweight for the convenient usage. These are easy to set up and provide no hassle for the user when it is mounted on the fishing rod. Whereas when you look at the spinning reel, these have a visible spool atop and it is not as sleek, compact or lightweight as the bait casting reels are. The mechanism used in baitcasting reels and the spinning reels are also different. In the spinning reel, the line travels through a lever to the side whereas the baitcasting reels offer a line guide through which the line passes straight to the outside when swing. Baitcasting reels support a wider range of line types in which they also support heavier lines which are capable of supporting heavy lure and baits and provide more strength to assure more powerful drag no matter the weight of the fish you are going to hunt. Spinning reels use thin line and they are not as strong as the baitcasting reels are which limit the capability of the fishermen to catch up to the bigger fish. In the spinning reels, the line is casted from above a side lever and is offer easier casting. But the accuracy and control over the line casted are not as good as it is there in the baitcasting reels. The spinning reels do not allow the brakes system which is available in the baitcasting reels. So the line control is better in the baitcasting reels as compared to the spinning reels. Though spinning reels are easier to use for the beginners as they are not much complicated to control. Baitcasting reel along with the ball bearing support, give smooth line cast. Their high-quality brake system assures that you can cast the line with accurate line length and target the area that is your focus. These two features are not there in the spinning reel and in most cases, you cannot get an accurate control over the line cast that impairs your ability to target on the focused spot. Though casting the line sideways is easier with spinning reels. Baitcasting reels are good at handling heavy lures or any type of lures you want to use. This widens your options to make use of the various baits and lures so that you may have a better control over what you target and catch up during fishing. Spinning reels support lightweight lines and may not support heavier lures and are only good for plastic or small live baits. The bird's nest issue is supposed to be the biggest issue with baitcasting reels caused due to the backlash which is not present in the spinning reels. Though most of the high-quality baitcasting reels have made sure that they control backlash issue quite actively and they would not backlash hence would not cause bird’s nest issue. Since we have carefully compared the upsides and downsides and the visible differences of the baitcasting reels and spinning reels we can deduce that baitcasting reels are much accurate, sophisticated and powerful than the spinning reels. They offer line control and customized operation. This assures to give a professional output very easily that is why it is assumed to have a good fit for the professionals and experts. Whereas the spinning reels are considered to be a good fit for the beginners who are not very well aware of the accurate line casting nuances. They can work with spinning reels easily because they might not be targeting bigger game fish which is a function of baitcasting reel with thicker fishing line.